A new school year means the return to routine – and the challenge that goes along with that. Parents report that one task that tends to get long in the tooth quickly is keeping up with a menu of interesting school lunch ideas. Hectic schedules and daily chaos seem to zap creativity, leaving many to default to the same tired apple slices and celery sticks day after day. Sugar Kiss melons: This California melon is the sweetest of the melon family and packs a punch of flavor, dissolving like sugar on your tongue. Say that magic word to your kids and watch how fast they eat it. It's a very versatile melon, too, because it pairs with a variety of other foods. Here's a quick and easy dish that your kids will love: Toss together cooked soba noodles, cooked and diced chicken, Sugar Kiss melon slices, red bell pepper slices, scallions, fresh cilantro and basil with rice vinegar and fresh lime juice. Make it the night before, pop a single serving into a Tupperware and slide it into the fridge. A word about lunchboxes: The key to keeping your kids' lunches fresh is a good lunchbox. Here are a few suggestions: The Fit & Fresh Multi-Flex Bento Box has five compartments to keep your kids' food from running together, and comes with an ice pack that will keep everything cold. The Arctic Zone Big Burger Expandable lunch box is shaped like a burger and expands if you're packing for two. 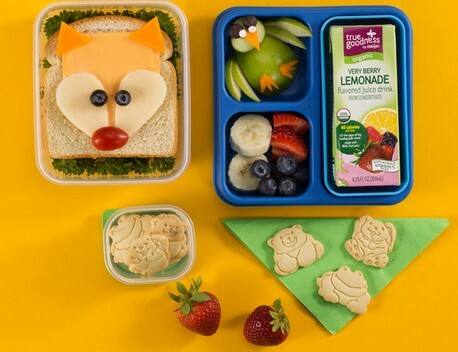 The Rubbermaid LunchBlox Kit has varying sizes of individual containers that snap together, and also snap to reusable ice packs.